If you enjoy the cost-savings and social interactions you get on GrabHitch, help us – help you, by inviting more drivers to join the GrabHitch community to increase your odds of getting a ride! Our Hitch drivers are often regular morning/evening commuters just like you, and they choose to give you a ride so that both of you can save time, reduce travel costs and enjoy the comfort of getting a ride instead of having to take public transport. And we need more of them! If you’ve tried referring GrabHitch to your friends before, we thank you! And for the month of December, GrabHitch will give you $20* in Grab promo codes for every driver you invite to our community, AND your friend will get $20 in his/her Hitch driver wallet as well! All your friend has to do is to complete ONE ride by 12:00hrs on 31st December and BOTH of you will qualify for your respective $20 incentives. That’s it! Terms Apply*. 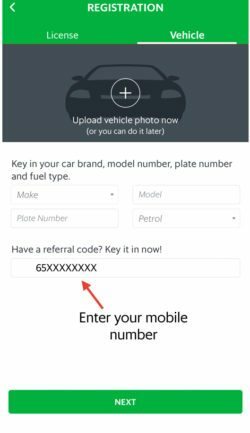 PASSENGER – Use Your Mobile Number to Refer! Ask your friend to press the blue DRIVE button to start the sign up process. Select the ‘Gift box icon’ in your GrabHitch Passenger Screen. Click on the ‘MORE’ (…) icon. The alpha numeric characters at the end of the link – http://invite.grab.co/XXXXX – is your unique referral code. Make sure you send your unique referral code only, and get your friend to sign up as a GrabHitch driver using that code. Select the ‘Gift box’ icon in your GrabHitch Passenger Screen. Still unable to find your referral code or have questions regarding the scheme? Email us at grabhitch@grab.com with subject “Hitch Passenger Referral” and we will get back to you in 2-3 business days. The $20 promo code for referrer / $20 credit for referred scheme runs from 1st December @ 00:00 hours – 31st December @ 12:00 hours. For our Hitch drivers who are also passengers – the Driver Refer Driver scheme takes precedence over this scheme, so your referral will be logged as a Driver referral instead of Passenger referral. Passengers have to ensure that the driver they refer signs up with the PASSENGER’S mobile number (include 65 in front e.g. 6512345678) OR Personal Referral Code for them to be considered a valid referral. Passengers will only receive their $20 Grab Promo Code if their referred friend successfully completes ONE GrabHitch ride as a driver by 12:00hrs on 31st December. After the referred driver has completed his/her ride as a driver, please allow up to 10 working days after the incentive period has ended (ie. post-31 Dec) for the $20 Grab Promo Code to be processed and given to you. Drivers have to sign up with the passenger’s mobile number (include 65 in front e.g. 6512345678) and do ONE successful GrabHitch ride as a driver by 12:00hrs on 31st December to count as a successful referral for your friend. After completing your 1 GrabHitch ride, please allow up to 10 working days after the incentive period has ended (ie. post-31 Dec) for the $20 credit to be transferred into your GrabHitch driver wallet.